Silver threads had begun to weave through her wavy strands of hair. She never took it as a cue to slow down though. Her knees were definitely displeased and would occasionally send painful reminders that she was not young any more. Those were however, disdainfully neglected. Everything had to be done as they were done in the years that flitted by; invariably. Summers were not as harsh then as they inevitably have become these days. Still, the days were bright and hot enough to dry and preserve all sorts of treasures for the rest of the year. And so every year when the weather seemed right, she would ask him to cut down a branch or two from the Cinnamon Tree that graced a corner of the courtyard. He would of course, oblige. He loved doing little things around the house as much as he loved his research lab at the Chemical Company. Whether it was mixing up all sorts of concoctions to care for their impeccable Rose Garden or making a 'Thettali' (Slingshot) to scare the crows away when they turned a bit impertinent, everything was done with the same ferocious efficacy that distinguished him in his illustrious career. A few branches would be cut down, the tree pruned so that it would be even more vivacious the next season. Once the branches were brought to the back of the house and chopped to pieces that can be easily handled by her, she would sit down with a sharp knife and start shaving them. The outer layer was usually discarded (unlike the store bought one pictured here) and the strips were made thin, or so I remember. A tedious process; but then, long, wearisome projects rarely deterred her. Which reminds me - cinnamon sticks that we get in Kerala are usually of this kind and not the rolled ones like above. The rolled ones that I have here were given to me by my sister a long time ago and I mostly use them as props (Ahem!). So when I say, an inch or two of cinnamon in the recipes, what I am referring to is usually the unrolled kind (below). The strips were collected in a 'Muram' (A sort of Bamboo Winnowing Basket) and would later be spread out on a mat under a soft sun to dry. The whole process was one of utter joy for the two grandchildren. Plenty of things to play with and make a mess of; unknowingly, they were also building memories that would last a life time. As much as I can ascertain, the cinnamon that we get here (in the second picture) is True Cinnamon (just that the way in which it is processed is different from that of the rolled cinnamon). The leaves of the tree look exactly the same as that given on Wiki and elsewhere under Cinnamomum Verum. This is the fifth post of the Spice Series. A few months have passed since I last posted; a long hiatus as usual. It is always hard for me to come back here after vacations for some reason. And this time, I have recipes that were shot even before we went home. I got a bit detached from the blog, but then that is nothing unusual if you have known me in the past few years. Also, I had several distractions at hand. For starters, I fell again into the vicious circle of enthusiastically beginning cross stitch works and leaving them halfway done. I had vowed to myself not to take up any needle work for some time. It is incredibly tiring to the eyes and I never seem to like simple patterns. I am half blind as it is and at this rate would end up doubling the power of my spects. Sigh. And then there were some things that needed to be sorted; or rather things that needed to sort out by themselves. Happily, things have fallen into place, at least temporarily. A good thing is that during the break I came across several start ups that I just love. I will hopefully get to mention them over a few posts once I sort out my drafts, clogged with posts that should have been up earlier. In any case, despite not touching the camera for weeks, I still ended up styling these shots with 'lines' as before. I have gotten over the look now, but I have enough to tire you out. May be I will just disperse them in between more normal shots. The cashews make this curry slightly rich, though not gloatingly so. Also, it does not have much gravy. So you might need some dal curry or something similar on the side, especially if there are those who demand plenty of gravy at the table. Ginger Garlic Paste, freshly pounded - 1 tbsp. Kashmiri Red Chilli Powder - 1/2 tbsp. Homemade Meat Masala Powder - 1/4 tbsp. Homemade Meat Masala Powder - A couple of pinches. Heat up some oil and fry the cashews till they turn golden. Drain and keep aside both the oil and the nuts. Add more oil to the pan, followed by the sliced onions. Saute till they turn a deep brown and then add the ginger garlic paste. Fry it till the raw smell is gone and add all the powders. (Add a touch of water if needed to prevent the powders from burning.) Saute well and add the chicken. Turn the heat to a high and stir so that the masala coats the chicken and the outside of the chicken pieces gets sealed. Now add some water, salt, and lime juice. Stir well and cook covered till the chicken is more than three quarters done. Now add the leaves and the fried cashews. Allow the chicken to cook completely. Taste and adjust salt, lime juice and meat masala, and switch off. Transfer to a serving bowl and garnish with a couple of pinches of meat masala powder and the fried chilli/cilantro. As was mentioned earlier, it is important that you slit the chilli before putting it in oil. Otherwise it will burst and cause the hot oil to splash out and burn your skin. I use Kashmiri Red Chilli Powder in most of my curries for its milder and richer taste. You can use a spicier type or a combination of both if needed.
" I am the true vine, and my Father is the gardener. so that it will be even more fruitful. You are already clean because of the word I have spoken to you. Remain in me, and I will remain in you. No branch can bear fruit by itself; it must remain in the vine. Neither can you bear fruit unless you remain in me. thrown into the fire and burned. ask whatever you wish, and it will be given you. showing yourselves to be my disciples. " John 15:1-8 (NIV), As spoken by Jesus to His disciples. This was shot more than a year ago. I thought these verses fitted the shot beautifully while I was editing it (although they don't really show the branching off of the vine, strictly speaking). 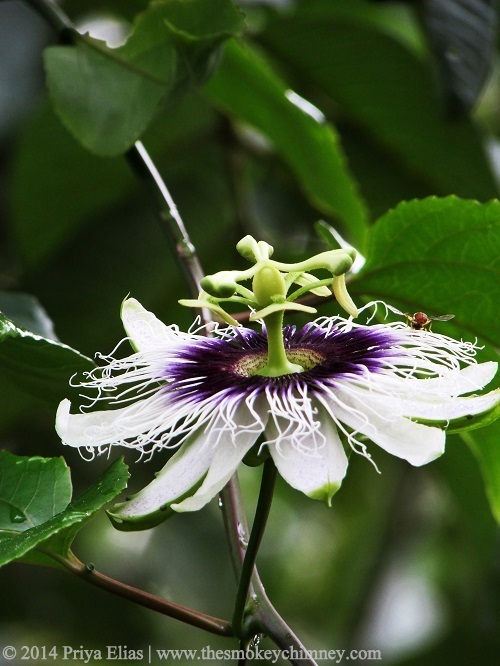 The flower is that of a passion fruit.